Today I’m going to be going over a high-quality axe made from one of the oldest manufacturers in the world: the Hultafors Classic Hunting Axe. Specifically, I will be reviewing the 850g, 500mm axe. For those not familiar with the metric system, that’s roughly 2 pounds in weight and almost 20-inches in length. 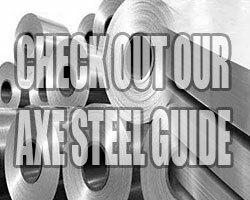 This is an exceptional tool that maintains an elegant, traditional appearance while boasting some of the best steel available. 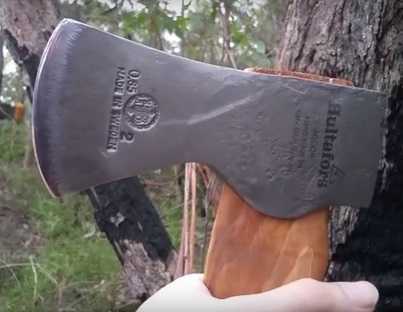 This Swedish brand axe is hand-forged using time-honored techniques and stuck several times to truly reinforce its durability. It is beautifully designed with a real hickory handle and rounded neck. This tool is both rugged and graceful, and will chop wood, skin game, or tear through doors with ease. The tempered zone on the blade offers superior sharpenability without heavily affecting the strength of the edge. Hultafors was founded in Sweden in 1697 and has been producing high-quality tools ever since. This particular model, the Classic Hunting Axe, is available in a few sizes and styles so you can find the axe that best suits your particular needs. This larger model, the 850g, features the longest handle but it’s fairly light weight makes it an adequate size for carrying in a pack. What’s really great about this tool is the strength of the steel. It is reliable as well as versatile and will stand up to its fair share of moderate to heavy-duty brushwork. The bulge under the neck helps to protect against splitting during overstrikes. Plus, the curved shape towards the end of the handle offers a comfortable area to grip the hatchet. Gloves are always recommended when doing axe work, but particularly with this tool since the handle has no added grip. A lanyard can be attached to the end to offer additional security when handling. Now, these axes are not the cheapest available, but you are definitely getting your money’s worth when you purchase one! A soft leather edge protector is included with your purchase. It fastens with a simple strap function and features decorative studs around the edge. Some additional features include precision balanced head, protective coating on the blade, and flat end that can be used to hammer in nails or break down branches. This delicate yet sturdy blade can be used in brushwork, kindling, some tactical operations, and can even be a great accompaniment when hunting or fishing. The blade itself comes sharp from the factory and boasts an HRC of 58 – 59, putting it up to par with some of the finest knives. If you consider yourself a rugged outdoorsman with a taste for tradition, this is definitely the axe for you. Overall, I have no negative comments for this axe. It’s simple but it will still pack a punch. The hickory handle really gives it a refined appearance, and the Hultafors logo can be found tastefully printed on the side of the handle. The axe head is made from some of the finest hand-forged Swedish steel measured at HRC 58 – 59 and hammered to perfection. The company themselves acknowledges that this process is admittedly more time-consuming and expensive, but producing quality materials is of utmost importance to the Hultafors company. When you purchase the Classic Hunting Axe, you can be sure you are buying a remarkable product. This company is one of the oldest in the world, so you can be confident they know what they’re doing. 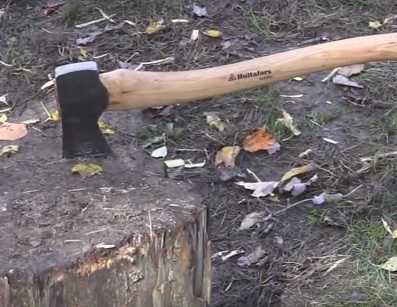 The 20-inch axe is perfect for hunters, outdoorsmen, campers, and woodworkers alike. I highly recommend it.